India takes great pride in its diversity and pluralism. The creation of the Islamic nation of Pakistan during independence may have prompted India to declare itself a secular republic, but the moments preceding the division had already given birth to a fringe group of Hindu extremists espousing an ideology called Hindutva. Hindutva’s main exponent Vinayak Damodar Savarkar conflated janmabhoomi (motherland) and punyabhoomi (holy land), propagating the establishment of an exclusive Hindu nation state. While usurping Jainism, Sikhism and Buddhism as part of Hinduism, the ideology rejects Christianity and Islam as alien and foreign. In 1925, the Rashriya Swayamsevak Sangh (RSS) was formed, a kind of nationalist volunteer corps which today is the parent of groups including the Bajrang Dal, the Vishwa Hindu Parishad and the national political party Bharthiya Janta Party (BJP). Together known as the Sangh Parivar, they champion the cause of Hindutva in India. Fanning false insecurities among the majority community about non-Indic religions, these groups have sharply communalized large sections of society. As a result, they have directly been responsible for plenty of violence and terrorist activity, including the assassination of Mahatma Gandhi in 1948. In 1992, a mob of Hindus demolished the 16th-centiry Babri mosque in the northern city of Ayodhya, claiming it as Lord Ram’s birthplace. Sangh Parivar’s biggest leaders condoned it. It resulted in months of Hindu-Muslim riots all over the country that killed about 2000 people. In 2002, BJP’s Narendra Modi, the Chief Minister of the western state of Gujarat, presided over one of the bloodiest chapters in the history of independent India. When a train with Hindu pilgrims caught fire, saffron-clad mobs reacted by destroying homes and property of Muslims, killing between 790-2000 and leaving thousands injured and homeless. Several journalistic investigations and credible reports show that the complicit state allowed, and even encouraged this rioting for three days. Till today, victim-survivors have been struggling for justice, and the same Modi at the helm neither expedites justice nor expresses regret for the grave losses. Yet, he has been elected to head of state thrice. In this context, with the Indian national elections set to occur in April 2014, the emergence of the BJP and its Hindutva poster boy Narendra Modi as the prime ministerial candidate for the world’s biggest and most diverse democracy is worrying. He comes in a context of extremely poor governance and shameful corruption from the ruling UPA coalition government headed by the Congress party, and now sways many frustrated voters with the words “With Modi, good days will come.” However, he also comes from the context of Hindu extremism. It is telling that Modi’s prime ministerial candidature was announced by the RSS, instead of the BJP. The convergence of the two has visibly begun, which does not portend well for a country with 20 percent non-Hindus. Together with heavy corporate backing, savvy marketing teams and a media singing to his tunes, for the moment, the winds are blowing in Modi’s favour in spite of his being the one candidate India does not need or deserve. It is important therefore to analyze how Modi’s brand of Hindutva, now coined as ‘Moditva’, violates human rights in a pluralistic India. Hindutva at the heart of the development bubble: Hindutva has, as have most fundamentalist movements in the world, consistently hankered for both economic and political power. Modi ensures that the fruits of economic power reach those who matter in the nexus, like big businesses, affluent Gujarati diaspora in US and UK, and vested interests. In his 12 years reign in Gujarat, a select few have amassed huge wealth in a criminal quid pro quo and are his chief propagandists. No allegations of communalism or questions of secularism are ever tackled. Instead, they are couched in a development package. The BJP’s 2014 manifesto waxes eloquent on economic growth, but also slips in a promise to build the controversial Ram temple on the site of the demolished mosque in Ayodhya. In Gujarat, school textbooks project Adolf Hitler as a strong administrator but make no mention of the Holocaust. To cover up his responsibility in the Gujarat carnage of 2002, he launched the ‘Vibrant Gujarat’ investor summits immediately after. Big corporate investment is pumped in, but the economic growth is unequal. Modi’s Gujarat closed down 60,000 small scale industries, and charges the highest tax on fertilizer while giving land and water at negligible rates to corporates. It is one of the few states in the country where the mandatory anti-corruption ombudsman was never appointed. Even while the state’s debts trebled, it budgeted Rs. 2500 crore to build ‘the world’s tallest statue’ of an independence-era leader it has co-opted as a great Hindu. In a sense, despite his economic platform, Modi has walked the talk only on Hindutva issues. Moditva then, is little more than Hindutva. Growth of propaganda: Virulent propaganda from Modi’s PR firms makes sure Indians see and hear him everywhere, on huge hoardings, on hand-outs, in newspaper advertisements, on driving application forms, on radio and television. Modi’s spin-doctors are able to turn lies, myths and half-truths into believable propositions. 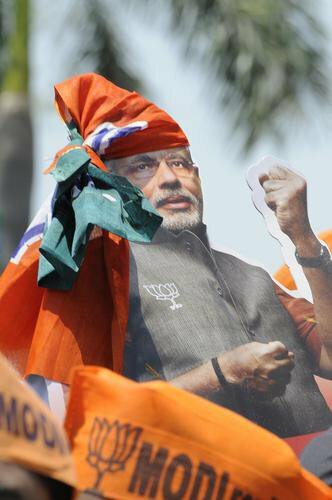 A cut out of Narendra Modi during a rally in his support on April 24, 2014 in Varanasi, India. Arindam Banerjee/Shutterstock. All Rights Reserved. Moditva claims stunning economic development under Modi. But a recent study measuring the average economic performance of states in the past five years shows that Gujarat has fared far worse than Bihar, Andhra Pradesh, Maharashtra, Haryana and Tamil Nadu. The state ranks 13 on the hunger index, close to half the five-year-olds in the state suffer malnutrition, and poverty has risen in ten years to 40 percent. Sidelining minorities: After the omissions and commissions in the anti-Muslim violence in 2002, instead of reconciling differences and erasing identity-based polarities, the state has entirely sidelined most minorities and particularly the Muslims. Minorities in Gujarat do not have easy access to employment and other privileges which the majority community enjoys. For example, under a Central government scholarship scheme, of more than 52,000 minority students in Gujarat eligible, the state did not recommend a single one for funding. Gujarat ranks 12 in implementing forest rights of tribals. Not a single Muslim candidate was given a BJP ticket to contest in the 2012 election. Modi did do a Sadbhavna yatra, or tolerance tour in the state, but minority community leaders were forced to attend these make-believe shows. The photos were then used by his propagandists to prove that their leader no longer indulges in minority-bashing. The hypocrisy is undeniable when, in an interview to Reuters, Modi made an allusion to Muslim deaths in the 2002 riots as “a puppy” coming under a car in a highway. More directly, in 2003, his government passed a glibly-named Gujarat Freedom of Religion Law, a draconian anti-conversion legislation targeted against the Christians and Muslims. Authoritarianism: Modi and his loyalists have been doing their best to control the judiciary, the police, media and education. The political influence not only tries to exonerate guilty friends and supporters, it also has communal undertones. For instance, 4000 riot-related cases were simply closed by the state police. And even after the Supreme Court ordered a compromised Gujarat Police to reopen 1,958 riot cases, arrests were made only in 117 cases. Investigations against Muslim rioters have moved much faster than those against Hindu rioters. While some officers and administrators have courageously defied such influence, including former Additional Director General of Police, R B Sreekumar and police officer Sanjiv Bhatt, Modi is able to strike fear in most others. His dissidents like his Home Minister Haren Pandya have either been killed, had cases foisted on them or have had to face harassment and intimidation. He has polarised his own party, sidelining the old guard. Some of his own party-men maintain that he rules by “terrorizing” others. Reacting to the BJP coining the “NaMo” chant, likening Modi to a Hindu god, senior BJP leader Jaswant Singh said he didn’t think “veneration of an individual is a proper attitude for a political party”. Keshubhai Patel, a former Chief Minister of Gujarat who Modi succeeded, regards Modi as the Hitler of Gujarat. Singh was since expelled from the party and Patel quit. While Modi will always retain the core ideology of Hindutva, his personal taste for power is certainly in megalomaniac proportions – too individualistic, too autocratic and too opaque. The impact of identity politics: While not all Hindus in India subscribe to Hindutva, understanding that the idea of a Hindu nation state violates the pluralistic character of the Constitution of India, it is undeniable that the middle-class and a large section of the rich are quite taken by Moditva. He provides them with a heady cocktail of the fruits of globalisation, economic power and hard-core religious fundamentalism. Identity politics is an unfortunate political tool across the country, and its success in garnering votes has legitimized its use. Hate speeches keep political careers secure. It has meant the destruction of democratic principles and the values enshrined in the Indian Constitution. Modi is one such polarizing figure and his unapologetic divisiveness makes has caused large sections of Gujarat to live under apartheid. This wave of fundamentalism and authoritarianism has already had serious repercussions all over the country. India is too diverse a country for a person steeped in communal ideology. While a majoritarianism has indeed enveloped India today, people are aware that every religion practiced here is based on a particular value system. The concept of good (holy) and bad (sin) may differ from time to time. But there are certain non-negotiable tenets universally accepted and enshrined in the Universal Declaration of Human Rights. These rights cut across all religious beliefs and ideologies, and they also deepen the spirituality of the religious. As a Christian priest and a human rights activist, I am convinced that if one has to serve one’s faith, one has to be deeply engaged in the promotion of Justice. The Indian insignia, the wheel of life, embodies the life and teaching of Lord Buddha popularized by the beloved King Ashoka. The Ashoka Chakra symbolizes the king’s change of heart, a movement from unjust, untruthful, violent behavior towards peace and inclusion. Lord Mahavir, the founder of Jainism places non-violence at the core of a good human being. The Islamic way of life marries acts of worship with generosity, good deeds and the opposition to injustice and evil. Guru Nanak propagated equality among his followers of the Sikh religion. As Sharma shows, Hinduism too, in its essence, is about tolerance and dignity for all. Only those who misunderstand deep spirituality believe that genuine faith and human rights are incompatible. Many in India today are guilty of underestimating religious extremism, especially when it comes with the lure of economic growth and a well-marketed leader. Modi’s divisive, violent, exclusive Hindutva informs everything else he stands for. It oversteps core Hindu beliefs, using religion not to guide an inclusive politics but an authoritarian one as dangerous to Hindus as it is to minorities. Clear-thinking religious Indians need to condemn the mal-intentions of right wing groups to destroy what is sacred in the Indian constitution. As I have tried to demonstrate, Hindutva as an ideology violates the rights of a modern, diverse India. The challenge for the biggest democracy of the world, therefore, is to have the maturity to continue to mainstream those value systems that have been a longer and integral part of its history: dignity and equality.